the blessings of His salvation. Hassidic Jews: Who are They? Spelled Hassidic, Hasidic, Chassidic or Chasidic, over 300,000 such Jews reside in the New York metropolitan region. 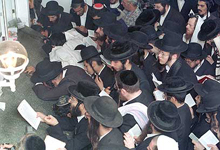 Though commonly referred to as ultra- Orthodox, Hassidic Jews (or “pious ones”) most prefer to be described as “fervently observant.” (The term ultra-Orthodox also applies to the Misnagdim literally, “opponents,” who at one time had serious disputes with the Hassidim.) Hassidim (“im”denotes plural) live in closed, tight-knit communities where Yiddish is the mother tongue. Men wear distinctive black garb including hat, long coat, pants, and shoes. White shirts and tzitzis (fringes) are worn beneath the coat. They have peyos (side locks) and beards. Hassidic women wear modestlength skirts or dresses with sleeves no shorter than the elbow. In the strictest communities, men do not touch or even speak to women outside of their family. secular should be made. Lubavitch Hassidism, on the other hand, reaches out to secular Jews in order to bring them into the fold. “abuse the sanctity of the mind” and are sinful. As you can imagine, the Hassidic communities have been largely unreached by the gospel. Belief in Jesus would not be tolerated . . . and to leave or be expelled from the community is unthinkable to many. No doubt others have witnessed to Hassidim, but as far as we know, our special outreach to this community was unique in both its scope and methodology. Reprinted with permission from the Jews for Jesus Newsletter. Copyright September 2006. All Rights Reserved. Original article. “I will meet to talk more about this, but I want to meet with a woman.” Normally our missionaries would conclude that a man who said this was not interested in the gospel. But this was the ultra-Orthodox aspect of BYG New York and our missionaries were on new ground. “Why a woman?” the Jews for Jesus missionary countered. While this answer may not have indicated a deeply felt spiritual hunger, it was frank and deserved consideration. They are called “rebels,” the ones like this man who are not satisfied with the life ordered for them by the ultra- Orthodox community. They are willing to consider new ideas but they are wary. To consider Jesus as the Jewish Messiah is forbidden, and most see no reason to consider anything that contradicts the rabbis’ teachings. Even the rebels who question the rabbis’ authority know that they would lose family, friends and livelihood if they allowed themselves to believe the gospel. Therefore, arranging a visit with a Hassid is complicated. One person told our missionary, “Go to such and such a subway stop. Wait on the far end of the platform. When the train comes, get into the third to last car. Don’t look at me as I get into the same car. Get off at such and such a stop. Follow me to a place where we can talk.” It sounds unreal. But it’s not. struggling to think for themselves. When we decided to make outreach to this community one of the sub- campaigns under BYG New York, we had no idea how to go about it. By God’s sovereign grace we were approached by friends who wanted our help to distribute a Yiddish version of a film about Jesus—and we sent the film to 80,000 Hassidic homes. Most of the actual campaign work was a matter of walking through parts of the communities, sometimes for four hours at a time, engaging in one-on-one conversations. have, unknown to the community, ceased any number of Jewish religious practices. They maintain the outer appearance because they don’t know any other way of life.